In the last series, Normalization Parts I, II, III, IV, and V, I approached normalization from a particular point of view. I put all the information into a single table then removed redundancies into separate tables. This method is called decomposition. Decomposition is fine for understanding the theory of normalization and for creating small databases. However, it is less useful for large databases. At least, I've found it so. So I'm going to talk about another way to approach normalization that starts with the individual pieces and builds it up into properly normalized tables. This method is called the Entity-Relationship method and the final result is an Entity-Relationship Diagram. An E-R diagram is useful not just for creating the data model, but for documenting it as well. Since we've been working with the Employee Database in our other examples, let's stick with it. But since I claimed that E-R method works for more complicated designs, let's make it a little more complex. I like to start with a short narrative of the requirements. ZYX Laboratories requires an employee tracking database. They want to track information about employees, the employee's job history, and their certifications. Employee information includes first name, middle initial, last name, social security number, address, city, state, zip, home phone, cell phone, email address. Job history would include job title, job description, pay grade, pay range, salary, and date of promotion. For certifications, they want certification type and date achieved. An employee can have multiple jobs over time, (ie, Analyst, Sr. Analyst, QA Administrator). Employees can also earn certifications necessary for their job. description, pay grade, pay range, salary, and date of promotion. For certifications, they want certification type and date achieved. All of these nouns must be represented in the database -- some as Entities and some as Attributes. An Entity is a "thing" about which we store information. An Attribute is the information that is being stored. So the next task is to group the nouns into logical groupings. At first pass, it appears that there are three entities: Employee Information, Job History, and Certification. It is useful at this point to put them in a grid and assign the rest of the attributes like Figure 1. Next, I need to assign primary keys to each entity. (At this point, I call them "entities" rather than "tables".) As I said in What Is A Primary Key?, a primary key is a field or fields which uniquely identify a record. At this point, I'm dealing only with natural keys. Figure 2 shows the primary keys. see if each attribute truly belongs to the entity. To determine the second, we look at "functional dependencies", which just means that each field's value depends on the value of the primary key. Now, what about the Job History table? Any time an entity has a compound primary key, you should look at it very closely to make sure all the fields depend on the entire primary key. Any particular job can have only one description, pay grade, and pay range. However, none of those depend on the Promotion Date. I've got a problem here and I need to take another look. What I really have is information about two different "things". Job Title, Description, Pay Range and Pay Grade pertain to the Job as a category. Everyone who holds that position will have the same values. On the other hand, Salary and Promotion Date will be different for each person. So I really have two entities: 1) Job (information about the job itself), and 2) Job History (information about a particular employee's employment history. 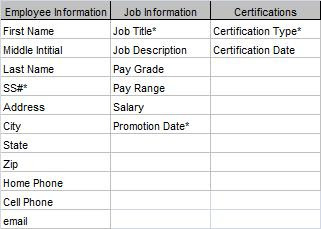 I need take Job Title, Description, Pay Range and Pay Grade out of the Job History table and put them in the Job table. Lastly, in the Certification table, Certification Date is also not fully dependant on the Certification Type. Different individuals achieve the certification at different dates. I don't have an entity to put the date in, so I'll put that to the side and come back to it later. Figure 3 shows the amended grid. At this point, it is useful to look at the Relationships between these Entities. We may be able to find a place to put our unassigned attribute. But I'll save that for the next post: Entity-Relationship Diagramming: Part II. In What Is Normalization, Part IV, I discussed the three basic kinds of relationships: One-to-One, One-to-Many, and Many-to-Many. In this post, I'll concentrate on the many-to-many. In real life, M:M relationships are extremely common. Each customer can order many products, and each product can be ordered by many customers. In high school, each teacher has many students, and each student has many teachers. At a conference, each attendee attends many sessions, and each session has many attendees. 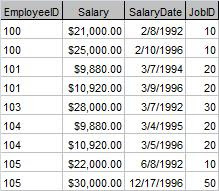 Returning to our Employee Database example, suppose we want to store a job description as well as the salary history. Since each employee can hold many positions over the course of his or her career, and each position can be held by many employees, we have a many-to-many relationship. So let's go back and change our original table and see how we can normalize it. You'll notice that I've changed the SS# field in favor of an EmployeeID field. SS# is a really bad field for a primary key. You still might want to store SS#, but not for a primary key, so I'm leaving it out of this example. But looking at the Job History Table, we can see that we still have redundant data. Job Description is repeated several times. Unfortunately, we don't have a convenient linking field as we did with the EmployeeID field in the Employee Table. So we'll have to make one up. When you make up a primary key, as opposed to using an already existing field for your primary key, it is called a surrogate key. I discuss the difference between surrogate keys and natural keys in What is a Primary Key? Okay, so what does this have to do with Many-to-Many relationships? Well, if you look at Employee and Job Types, you can see that there is actually a many-to-many relationship between these tables. Each Employee can have many Job Types over time and each Job Type can apply to many Employees. Unlike one-to-one and one-to-many, many-to-many relationships cannot be directly represented in a relational database. 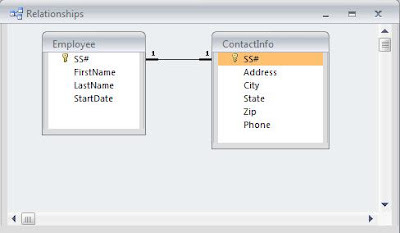 In order to create one in a database, we have to have an intersection table (also called a "linking table"). In this case, the linking table already exists: Job History. Notice that each primary key of the main tables is represented as a foreign key in the linking table, and while each of the foreign keys is part of the primary key of the linking table, neither is the entire primary key. So far, I've approached Normalization from a particular perspective. I've put all the information into a single table, looked for redundant data, and removed the redundancy into a separate table. This approach is called "decomposition". It works very well for simple data models, but becomes unwieldy in complex models. However, there is another approach that has proven easier for me to work with very complex data models. This approach is called Entity-Relationship Diagramming. In Entity-Relationship Diagramming: Part I, I'll talk about that. In What Is Normalization, Part III, I discussed how to create a relationship to join our normalized tables back together so that no information was lost in the normalization process. There are three basic kinds of relationships: One-to-One, One-to-Many, and Many-to-Many. A marriage is an example of a 1:1 relationship. A husband can have one and only one wife and a wife can have one and only one husband. Of course, in the real world, there are exceptions to this, but let's accept this as a general case. To implement a one-to-one relationship, you must have a primary key in both databases, which stores the same information, SS# for example. So continuing with our employee database example, suppose we had a ContactInfo table which stored Address, City, State, Zip, and Phone. In this simplified example, we'll assume that people have a single address and phone. The primary key for this table would also be SS# since each record in the ContactInfo table represents the contact information for a single employee. 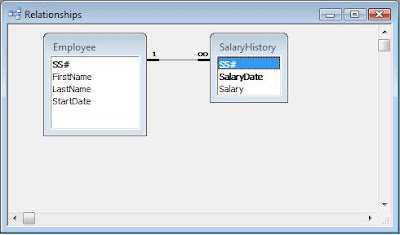 To create the one-to-one relationship, I would click and drag the primary key from Employee (SS#) to the primary key of ContactInfo (also SS#). Although the fields are named the same in this example, they do not have to be, however, they MUST represent the same information. In the Relationship Window, it would look like Figure 1. Notice there is a 1 on each end of the relationship. In relational databases, 1:1 relationships have limited utility. In most cases, the data elements from both tables can be combined into a single table. This type of relationship is also known as the parent/child relationship for good reason. If we consider a biological parents only, we can say each mother can have one or more children and each child can have one and only one mother. 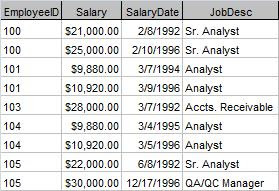 As I showed in Part III, the relationship between Employee and Salary History is a one-to-many relationship where each record in the employee table can be related to multiple records in the Salary History table, but each record in Salary History is related to only one record in Employee. To implement this type of relationship, you must have a field in the "child" table that corresponds to the primary key in the "parent" table. Again, this field is SS# in our example, However, unlike the one-to-one relationship, it is NOT the primary key of Salary History, although it may be part of the primary key. Figure 2 shows this relationship. One-to-Many relationships are extremely common in relational databases. In real life, M:M relationships are extremely common. You'll notice that in both the other illustrations, I had to qualify the definition of both a marriage and parent/child. That's because real world definitions are messy. In some places in the world, a man can have multiple wives and a woman, multiple husbands. Sometimes simultaneously. Children can have more than one parent. In the real world, these relationships many-to-many. Because many-to-many relationships are common in the real world, we must also know how to represent them in relational databases. Unfortunately, M:M relationships cannot be represented directly. They must be represented indirectly by a linking table and a pair of 1:M relationships. In What Is Normalization: Part V, I'll show how.